We wanted to highlight a report by the Utah State Senate on Utah’s dual language immersion. It tells the story of how the immersion program came to be and links to several news reports about dual language immersion in Utah. Read the full report here and share with your friends! This entry was posted in Uncategorized on January 30, 2017 by diparents. What happens with immersion in high school? First – what is the secondary pathway for dual language immersion (DLI) in Utah? Ideally students in 7th and 8th grade will take 1.5 credits of Chinese each year. We are very grateful to districts and junior highs/middle schools who allow parents flexibility in which classes their children take. Because of the small number of electives, for some students it will make sense to not take some classes (e.g., health, PE, FAC, art, music, Utah history, etc.) so that they can take the classes they really want to (e.g., health, PE, FAC, art, music, Utah history, etc.) and still take the full immersion load. So, when do students take AP Chinese? 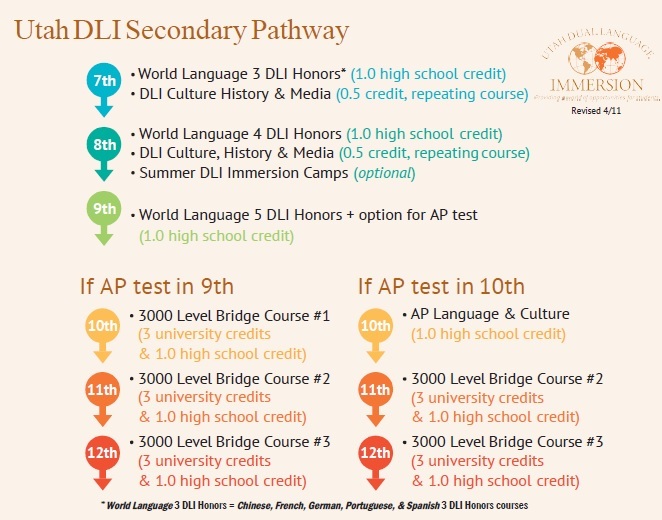 The current structure is for students to take the World Language 5 DLI Honors course in 9th grade, and if they are ready, to take the AP test. Let’s assume a student takes and passes the AP language test in 9th grade. What next? Your student will have the opportunity to take “Bridge courses,” which are funded by a state law passed in 2016. These are college level courses, with different courses being offered in 10th, 11th and 12th grades – helping students earn both high school and college credit. As stated here, “The [University of Utah’s] Second Language Teaching & Research Center has been charged by the Utah State Board of Education to lead the program and is working closely with all Utah institutions of higher education to develop and deliver 3000-level university courses to high school students. This program will allow them to graduate from high school with up to nine upper division credits and further facilitate their development of advanced language proficiency.” Incredible! Students can graduate from high school just two classes short of a minor in the foreign language. What if your child isn’t ready for the AP test in 9th grade? That student can take AP Chinese (or French, Spanish, etc.) in 10th grade and then take two bridge courses (in 11th and 12th grade). If you want more detail, you can read this narrative about the Bridge courses or watch a video that explains it. Some parents have expressed concern about the Regents scholarship. For example, “If my child takes AP Chinese in 9th grade, does she then have to take two consecutive years of a different foreign language in 11th and 12th grades?” Happily the answer is no. The Regents office has specified in writing (page 9 of this document) that the bridge classes WILL count towards Regents. In summary: 1. 7th and 8th grade students should take 1.5-2 credits of foreign language each year. We hope districts and schools will offer schedule flexibility so students can take the immersion classes and other classes that will be most beneficial for them individually. 2. Students will have the opportunity to either (a) take the AP test in 9th grade and then take three college classes (in grades 10-12), or (b) take the AP test in 10th grade and then take two college classes (in grades 11-12). Either of these options will satisfy Regents. Utah’s immersion program is awesome. Thank a teacher, administrator or legislator today! This entry was posted in What can parents do? on January 20, 2017 by diparents.